Power Drive De-Rolling Cradle with pneumatically operated raising and lowering cradle to accommodate fabric rolls of lesser weights and also facilitate tension free un-winding. Stainless Steel Sheet platform of required width placed at a specific height from the floor level. Fabric Roll End Stop sensor for joining the next roll. Photo sensor detects fabric edges and activates gear motor to shift batch rollers for alignment, thereby offering straight edged package. 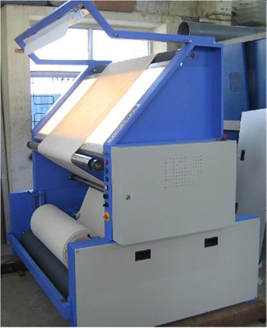 The Batching rollers can be located in the front (or) behind the operator, as per individual requirement. 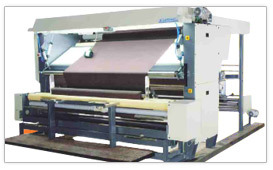 AC drive system to synchronize the speed between inspection table and de-rolling device for uniform fabric tension control.